Chemically reacting systems are difficult to characterize accurately. Whether we consider combustion in an engine or turbine, the complex chemistry of the atmosphere, or designing industrial catalysts, it is often a challenge to predict the behavior of these systems as chemistry couples with complex fluid dynamics, thermodynamics, and heat transfer. In the Labbe Lab, we strive to understand the chemical phenomena behind reactive systems using a combination of sensitive experimental measurements, high fidelity quantum chemistry theory, and model development to bridge the gap between observation and theory. Some of our current work is explained here. Feel free to contact us for more information. Two of the biggest challenges in combustion kinetics are detection of the initiation steps for reaction of fuels with oxygen and detection of reaction intermediates such as radicals, which have very short lifetime. Information about these initial reaction products that are impossible to detect in an engine environment may be studied under the controlled conditions of a micro reactor. The tubular micro reactor run collaboratively by Dr. G. Barney Ellison, Dr. John W. Daily, and Dr. Labbe allows us to probe the short residence time (~100-200 microseconds) thermal decomposition of fuels. The micro reactor is made of silicon carbide and is resistively heated to high temperatures (in red, Figure 1). Once the micro reactor is heated, our reactant mixture is passed through the micro reactor, generally under dilute conditions to ensure unimolecular thermal decomposition of the fuel. The stable, metastable, and radical products are then identified using a combination of powerful diagnostics: photoionization mass spectrometry (PIMS) and matrix infrared spectroscopy (IR). PIMS utilizes a pulsed laser to ionize the products. The ions are then detected using time of flight mass spectrometry (TOF-MS). A sample spectra is shown in Figure 2. In IR spectroscopy, we deposit the products and carrier gas onto a 20 K cesium iodide window, which freezes the molecules in an argon matrix. We then use IR spectroscopy to detect the frozen products. ​Currently, this micro reactor can only be used to study pyrolysis because silicon carbide is reactive with oxygen. To be able to address more industrially relevant problems with the reactor, we are redesigning the micro reactor to operate under continuous flow, to withstand oxidative conditions, and to have more stable thermodynamic properties. This will give us the ability to study the first chemical steps of combustion (oxidation) in addition to pyrolysis (thermal decomposition) for any fuel using our PIMS and IR spectroscopy diagnostics. Engine and fuel design is a complex problem involving the interface of multi-phase flows, turbulent flow physics, and chemistry. This presents a great challenge to understanding the fundamental forces that dictate how engine design and fuel molecular composition relate to efficiency and the production of pollutants. Thus, accurate kinetic models are critical for the design of new fuels that are renewable and safe for the environment and combustion engines that run efficiently and minimize harmful emissions. Speciation data (e.g. 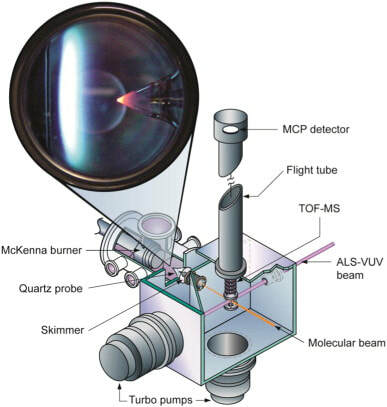 molecular-beam mass spectrometry sampling of flames, MBMS) is required for kinetic model validation and improvements. These experiments are challenging due to the hundreds of species, often unstable radicals with short lifetimes, present as intermediates in combustion. In order to obtain such data, Dr. Labbe now manages the “Flame Team” which conducts experiments at the Advanced Light Source at Lawrence Berkeley National Lab. There, an international collaborative team of researchers, specializing in MBMS and kinetic modeling technique operate the flame experiment during 1-2 week long campaigns approximately once a year. ​The experiment involves a laminar, premixed flat flame, often diluted with argon, at low pressures (~40 mbar). The flames are stabilized on movable, water-cooled McKenna-type burners. Gas flows are controlled with calibrated mass flow controllers, and liquid fuels are metered by a syringe pump, evaporated quantitatively, and added to the gas stream. Samples are withdrawn in the experiment with a quartz cone with a 0.40-mm-diameter orifice at the tip and an angle of 40°. The wall thickness of the probes is near 100 μm at the tip. The gas sample is expanded to ∼10E−4 mbar in the first pumping stage. 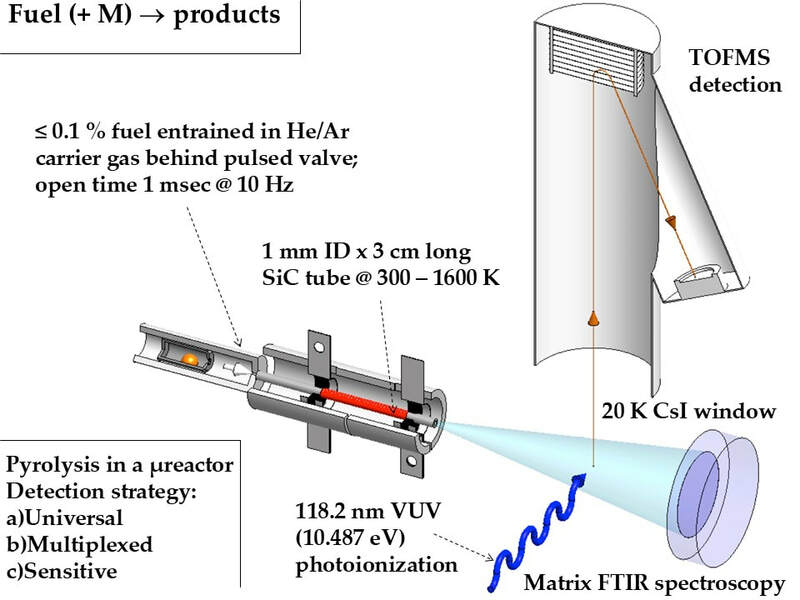 The center of the gas cloud is extracted by a skimmer, and the molecular beam then enters the ionization region of the mass spectrometer, kept at a pressure of ∼10E−6 mbar. 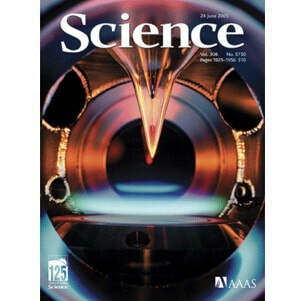 The complex reaction network for combustion processes includes many key species that have similar masses, which can only be unambiguously identified using the high mass resolution combined with the tunable VUV light found at the Advanced Light Source. 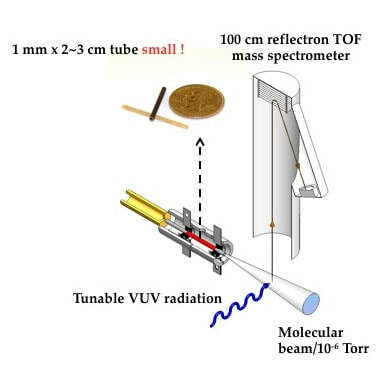 The almost fragmentation free, sensitive photoionization also enables quantitative data reduction that is complicated by fragmentation in electron ionization experiments. Photoionization is the performed with a continuous photon beam of ∼10E13 photons/s at energies between 8.00 and 17.00 eV; the energy resolution is about 0.05 eV. Analysis relied on a linear time of flight mass spectrometer with a mass resolution of m/Δm = 400.